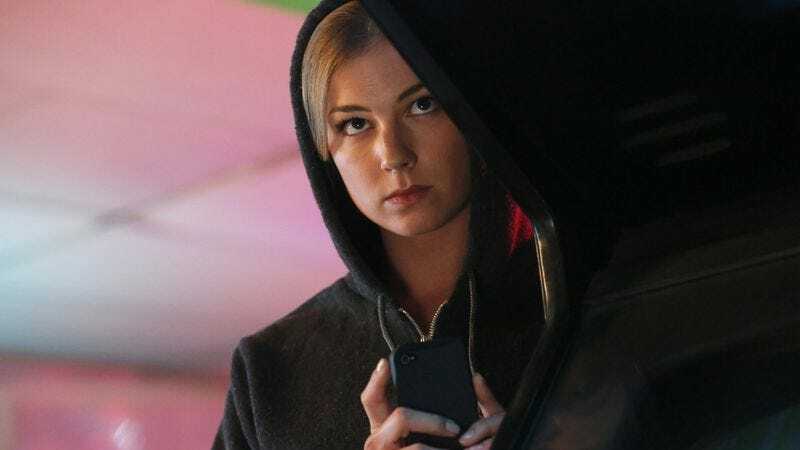 Season two of Revenge has been a rough ride, so it wasn’t too shocking to learn that showrunner Mike Kelley is departing the series at the end of the season. Under Kelley, what was a vibrant, twisty tale in season one devolved into a slow, unfocused slog for most of season two, squandering what was one of the network’s most promising young series. The interesting thing about the announcement to replace Kelly is the timing: By making a public statement, ABC is expressing public faith in the show’s future and almost guaranteeing a season three renewal. So now all that’s left to do until then is see how well Kelley wraps things up. For all that’s gone wrong this year, the last stretch of episodes has shown a renewed commitment to the themes that made season one great: Emily’s personal, visceral need to take down the Graysons. She took a big step in that direction tonight, but her exact plan still remains fuzzy, more of a concept than a plan. The big step Emily took tonight—once again agreeing to marry Daniel—has always been a bit hazy in reasoning, as her end goal by doing this has never exactly been clear. Marrying Daniel obviously gets her closer to the Graysons, and has the added bonus of driving Victoria insane, but is her plan in the end just to break Daniel’s heart? She’s already done that once by just breaking off their engagement. Despite not having a clear plan for taking down the Graysons, Emily does have a clear plan for someone else: The Falcon. The Falcon’s involvement with the Graysons ties him or her to everything awful in Emily and Nolan’s life—the framing of David Clarke, the murder of Padma—and Emily promises Nolan the best way for him to get over Padma is to get revenge. As a bonus, they will also get the chance to expose Victoria’s lies about the child she gave up for adoption when she was a teenager, which is something the Falcon helped her conceal. The plan is almost too simple: To force the Falcon to show his or her face by making them think their work was sloppy, using Victoria as the bait. It works, ending up with Nolan and the (obviously) female Falcon meeting in an arcade and playing a game of Street Fighter to determine if the Falcon is going to help Nolan scrub his past misdeeds from the web. Naturally, this is all a smokescreen so Nolan can install a shadowing program on the Falcon’s computer and discover her identity, taking her down and turning her into the FBI for all of her illegal hacking activity over the years. I say almost too simple because for a hacker who has been underground and protecting her identity for 20 years, she was awfully willing to insert Nolan’s jump drive without suspecting it might have nefarious software installed. Also almost too simple: The fact that the Falcon was a former employee of Grayson Global. It seems like this would have made her much easier to find. But the saving grace of the Falcon wasn’t the story itself, but what that story meant for the characters. The best thing about season two has been the development of the friendship between Emily and Nolan, and every scene they had together tonight was wonderful, from her pep talk about his computer skills at the beginning to her scanning the Grayson Global photograph to Nolan at the end so he could apply a red X to the Falcon himself. Emily VanCamp and Gabriel Mann have developed a wonderful brother/sister-like chemistry, and it really strengthens the show. As for the Graysons, well, they are a complete mess. Conrad—somehow—is gaining ground in his campaign for the governor’s office, and his next plan is to garner additional sympathy for his family by doing an interview with Nightline, an interview where he plans to stealthily reveal Victoria’s abusive history and resulting abortion as a teenager. Conrad really is a vile soul, but he is such an entertaining vile soul. Things backfire on him (which he really should expect because things always backfire on him) when Emily sends the information about Victoria’s very-much-alive son, Patrick, which the interviewer ambushes them with. Once again, Conrad blames his failures on Victoria lying to him, but what does he even expect at this point? Has either of them ever been truthful to each other, even once? He honestly deserves any shame that is heaped upon him for this simply because he is a moron. Victoria, though, has a much more interesting road ahead of her. Now that her secret is out in the open, she can do what she’s always wanted to do: find her son. She goes to Nolan asking for his help tracking Patrick down, and I honestly cannot wait to see what Nolan finds. Emily’s path to revenge might be a murky drag on the overall plot at times, but a secret long-lost son is a soap opera goldmine, and one I don’t think the show will squander. If it is somehow someone we already know? Well, even better. According to my TiVo’s description of tonight’s episode, the Falcon spells his/her name Fa1c0n. NOPE. Ignoring that. What is even happening with Ashley? Is she with Jack, or is she with Conrad? Is she playing both sides? Why is she even here? I did enjoy Jack’s complete and total rejection of Emily. If she refuses to tell him the truth about everything, it’s really what she deserves. To him she seems like nothing more than a traitor. Since when does Nightline do live interviews? And since when was Nightline Oprah? So Charlotte is going to get corrupted by this new friend, Regina? Yawn. Takeda showing up seemed promising, but he was only there to reiterate everything he’s already said before about emotions getting in the way of revenge. The one good thing to come out of it was Aiden’s insistence that revenge isn’t satisfying, and someday, Emily would learn this for herself, with him there to pick up the pieces. That was nicely tragic.